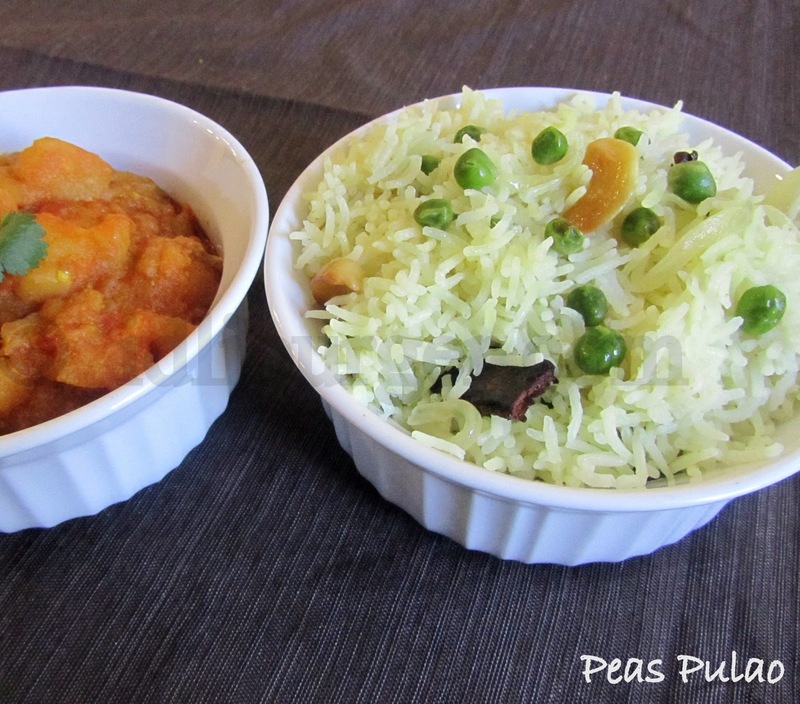 Second day of the blogging marathon and I chose a rice dish. Peas pulao is a simple yet a tasty rice recipe which can be prepared in a jiffy. I usually make this when pressed for time and want li'l IB to eat healthy and he loves it. Heat ghee, add cinnamon sticks, cardamom, cloves, bay leaf,cashews and fry till the spices release a nice aroma. Add sliced onion and green chillies and saute till the onion turn translucent. Add ginger-garlic paste and fry for 3 mins (till the raw smell disappears). Add dhaniya pwd, jeera pwd, salt, turmeric and peas and cook for 6-8 mins or till the peas are half cooked. Add soaked and drained basmati rice and saute for 3-4 mins, taking care not to break or burn the rice. Add the water and let boil. Adjust seasonings. Close lid and cook till rice is done. Once done, fluff with fork. Serve hot with curry and raitha of choice. Do check out and enjoy the wonderful recipes posted by my blogger buddies on the second da of the blogging marathon. Azeema, Champa, Gayathri Anand, Gayathri Kumar, Harini, Jay, Meena, Minu, Padma, Pavani, PJ, Priya Mahadevan, Priya Suresh, Priya Vasu, Rujuta, Santosh, Saraswathi, Savitha, Shanavi, Shobana, Smitha, Sowmya, Srivalli, Suma, Usha and Veena . My son's Fav. one ...Looks so temptimg ..
Easy breezy one pot meals are always welcome, aren't they? I love the colour of your rice. Looks divine. 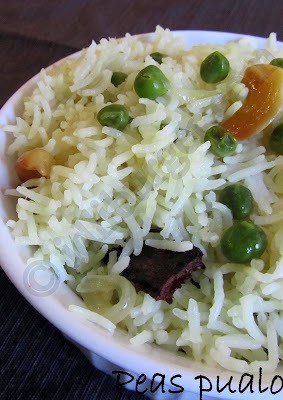 Great and very inviting peas pulao.. Perfect combination both those dishes looks so delicious. Hi Bhagi, hope everything is going fien with you!....Looks like i missed this during the marathon...The pulao looks too good and yummy!...I too make it this way...glad to follow U! Gorgeous and awesome rice, simply delicious.love to follow u..